100 Acres is a contemporary, ingredient-focused restaurant, bakery, coffeehouse, bar, & gathering space for the surrounding neighborhoods. Reservations are recommended. Please call 716.955.1511 to make your reservation. 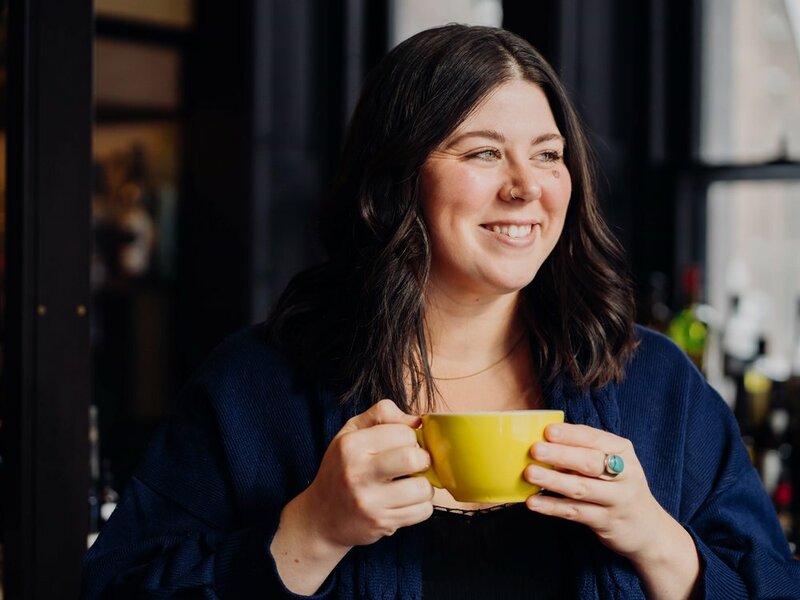 Nestled within the National Historic Landmark Richardson Olmsted Campus, 100 Acres is a contemporary, ingredient-focused restaurant, bakery, coffeehouse, bar, and gathering space for the surrounding neighborhoods. Come as you are, come as you're comfortable. Whether you're looking for a casual bite, or an upscale experience, we have a space and a dish for you. Each dish elevates fresh and simple ingredients showcasing the best of the season, based on sustainable relationships with local suppliers and farmers. Named after Frederick Law Olmsted's innovative use of space throughout Hotel Henry's grounds, 100 Acres conjures land - a proud nod to the agricultural and sustainable tenets of Olmsted's vision for the Richardson Olmsted Campus. sunny sips and bites at 100 Acres coffee house and bakery. Each menu item begins with one central ingredient, often locally sourced or freshly harvested from a partnered farm. 100 Acres' ingredient focused menu is committed to selective and sustainable sourcing; finding the highest quality ingredients with a focus on local agriculture whenever possible. Each menu item begins with one central ingredient, often locally sourced or freshly harvested from a partnered farm or our kitchen garden. The items and prices change very often based on what is sourced from our farms. Below you will find copies of our most recent menus. All of our menus, both food and drink, are hyper seasonal and may change daily. The below menus are subject to change based on fresh produce delivered to our kitchen from partnered farms. 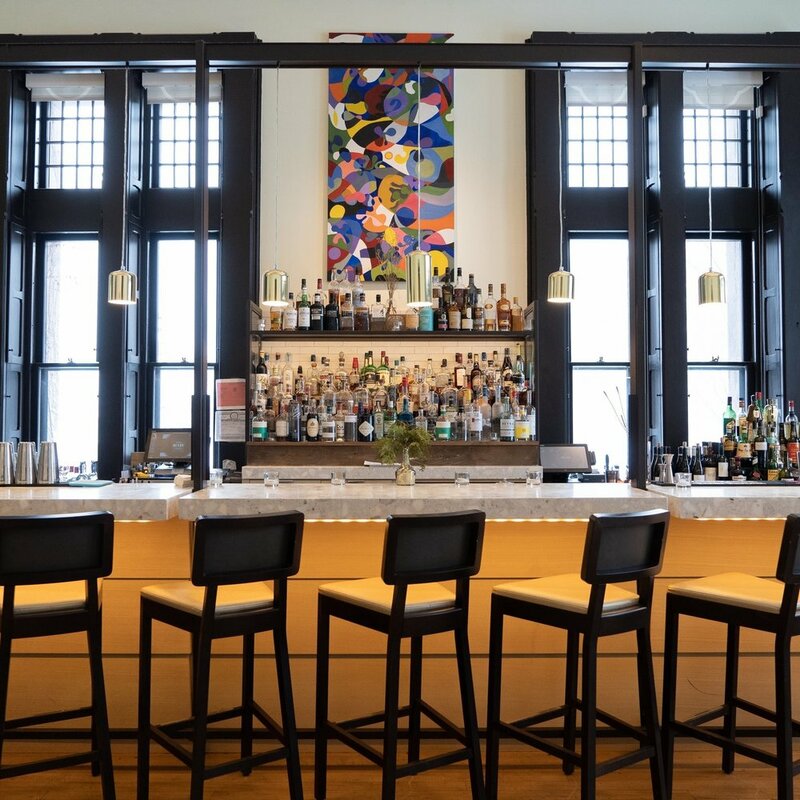 Explore the cocktail, beer, wine, and espresso menus at 100 Acres: The Kitchens at Hotel Henry. Authentically made, unpretentious coffee, enjoyable at any time of day—in the morning, over pastry in the lobby, hotel room or dining room; in the afternoon with a snack on the South Lawn; in the evening, over dessert and conversation; and anywhere else in the course of the day. Craft cocktails that are currently on trend and appropriately reminiscent of eras past, garnished with fresh pulls from our kitchen garden. A true Buffalo cocktail bar, 100 Acres is a gathering space for the city of good neighbors in one of the area's most iconic landmarks. 100 Acres makes creative use of the historic spaces on Hotel Henry's first floor. Sprawling halls, intimate corners, bright bar rooms, and a sunny cafe, all adorned with a rotating contemporary art exhibit. 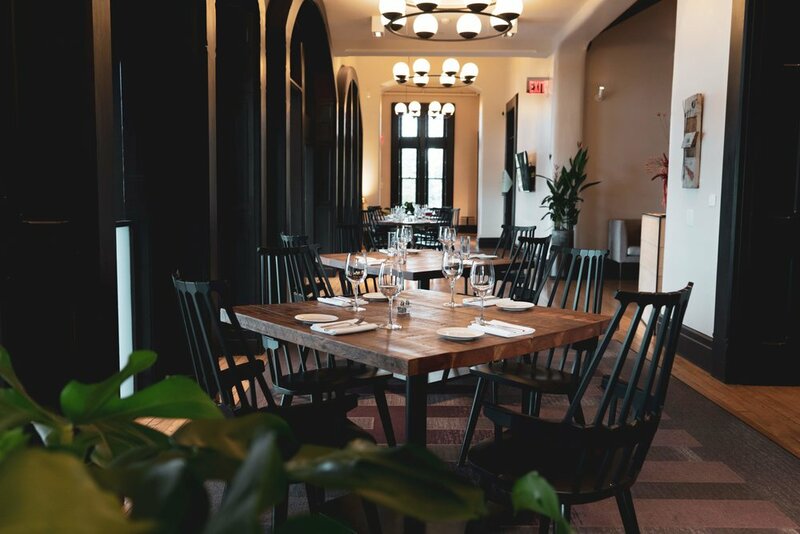 100 Acres offers a range of dining atmospheres nestled within the historic footprint of the National Historic Landmark building, from casual to upscale, to create distinct experiences for each visit. Come as you are and come as you’re comfortable, 100 Acres has a space for you. We hold ourselves to a higher standard. 100 Acres serves the best available ingredients, sourcing from farms and purveyors we know and trust. Each dish is meticulously crafted for a final product that tastes great and highlights the season's best flavors, sourcing from local and regional partners whenever possible. Our team is proud to play a role in creating lasting change for environmental sustainability in restaurants, raising the bar for Buffalo, NY. 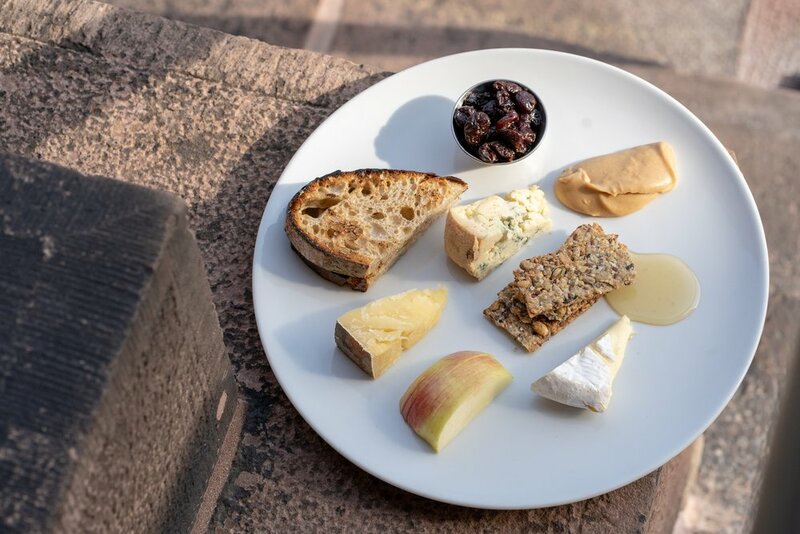 Dishes are prepared with organic grass fed meats and cheeses whenever possible, sourcing from local farmers and urban gardens Every dinner menu offers vegetarian, vegan, dairy-free, and gluten-free options. The name "100 Acres" comes from the original 100 acres of land reserved for agrarian use on the Richardson Olmsted Campus in the 1800s. Today, we restore the grounds to their original purpose - dedicated to hyper-local sustainable agriculture for the restaurant and events at Hotel Henry. Find fresh fruits, vegetables and greens throughout the restaurant, from the bar, to the menu, and your table. 100 Acres uses only USA-made, plant-based compostable packaging and take out products with a focus on sustainability and conscious business practices. 100 Acres and Hotel Henry are proud to feature World Centric Compostables, a partner that envisions a thriving world dedicated to reducing carbon emissions, economic development, environmental education, renewable energy, and communities across the globe. Make your reservation at 100 Acres: The Kitchens at Hotel Henry.